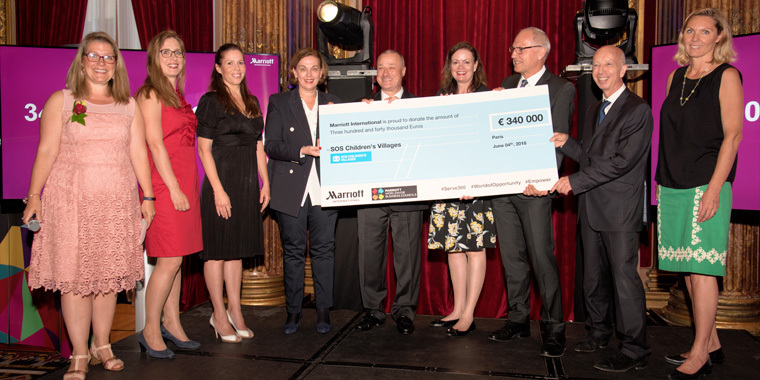 SOS Children’s Villages together with Marriott International celebrated our sixth year of a successful partnership, throughout which a record-high amount of $382,000 was raised for SOS Children’s Villages’ youth programs. While youth unemployment is a global challenge, with around 70 million young people unemployed worldwide, young people who have spent time in alternative care often face unique challenges as they prepare to embark on careers and independent lives. A core part of our work at SOS Children’s Villages is to support young people on their journey to self-reliance and finding decent work. Marriott International has enlisted more than 110 hotels in 21 countries across Europe to fundraise, facilitate in-kind donations, and volunteer with SOS Children’s Villages locally. In 2017, a total of $382,000 was raised by Marriott-branded hotels throughout Europe, through the “You Eat, We Give” campaign, as well as other local fundraising activities. The “You Eat, We Give” campaign, repeated in 2017 for the fifth time, took place throughout September and October. For every lunch and dinner served at participating hotels a donation of €1 or local equivalent was made towards SOS Children’s Villages’ youth programs. The promotion is part of Marriott’s Europe-wide “World of Opportunity” initiative, which helps young people from disadvantaged backgrounds reach their full potential by supporting programs such as those offered by SOS Children’s Villages that provide life skills and vocational opportunities. Marriott empowers disadvantaged young people through funds, raising public awareness for our cause and offering training opportunities and jobs at their hotels, supporting them directly in their path to independent life. The cheque was accepted on behalf of SOS Children’s Villages by Richard Pichler, Special Representative for External Affairs and Resources at SOS Children’s Villages International. “Our first regional partnership in 2008, where Reiner Sachau was an important driver, already showed how much can be done when we join forces in several countries. We have come a very successful way together. Aside of financial resources you have mobilized staff within Marriott to care for and help young people in their start into a professional life. Congratulations and thank you for raising an amount of $382,000 in 21 countries in Europe. This truly is an important commitment to the young people in our care!” he said. Picture (left to right): Philippa Boukari, Rina Hillinga, Patricia Molano, Gitta Brückmann, Reiner Sachau, Hemma Varma, Richard Pichler, Francois-Xavier Deler, Martine Doornekamp. Photo credit: Marriott International.